Yes. They are A Thing. They should be A Thing on your menu for this week too. Because seriously. Why not?! Life is short. 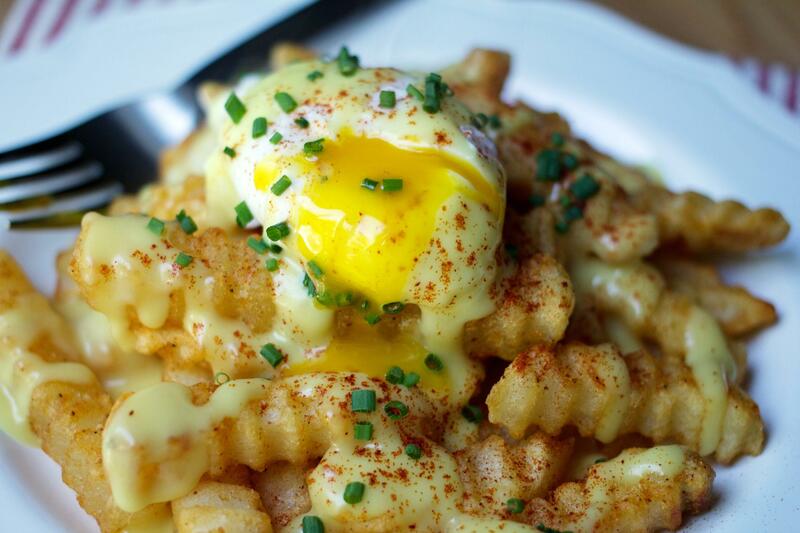 Eat the French fries, topped with creamy, tangy Hollandaise sauce, topped with a glorious poached egg, topped with smoked paprika and chopped chives. Eat them. Eggs Benedict Fries are what happen when it’s National French Fry Day, and you’re home with a sick kid, and you’re starving, and feeling creative. Sorry not sorry folks. Let’s talk about these fries for a second. Crispy, oven-baked fries (so they are healthy!). Hollandaise (need I say more?). A poached egg (another healthy element! ), but not just any poached egg – an egg with a gorgeous runny orange yolk, because nobody likes an anemically-yellow-snot-colored runny yolk. I mean maybe that’s fine for you but trust me when I say you do NOT know what you are missing. When you poke the yolk of a pasture-raised egg and let that orangey dream slip lusciously into all the cracks and crevices below it, you could convince yourself that no sauce is needed – that a runny orange yolk is all the sauce you need in this world – nature’s bounty – right there in a little orb of deliciousness. Anyway. Just make these. Obvi this is not the kind of thing you want to eat for dinner a few times a week, though I wouldn’t judge you. But hey, you home alone this weekend? Want something slutty to much on while watching Netflix? These are perfect for you. Eat like no one is watching. Even better when there is actually no one watching. Cuz if they’re watching they’ll want a bite. And you won’t want to share. Trust me. 1. Once everything is cooked, prepare in this order: Make a mountain of French fries on a plate. Ladle on some Hollandaise sauce. Top with your poached egg. Ladle on some more Hollandaise sauce, duh. Then top as desired with chopped chives and smoked paprika. * If you need instructions on how to poach an egg, I wrote some pretty good directions here.